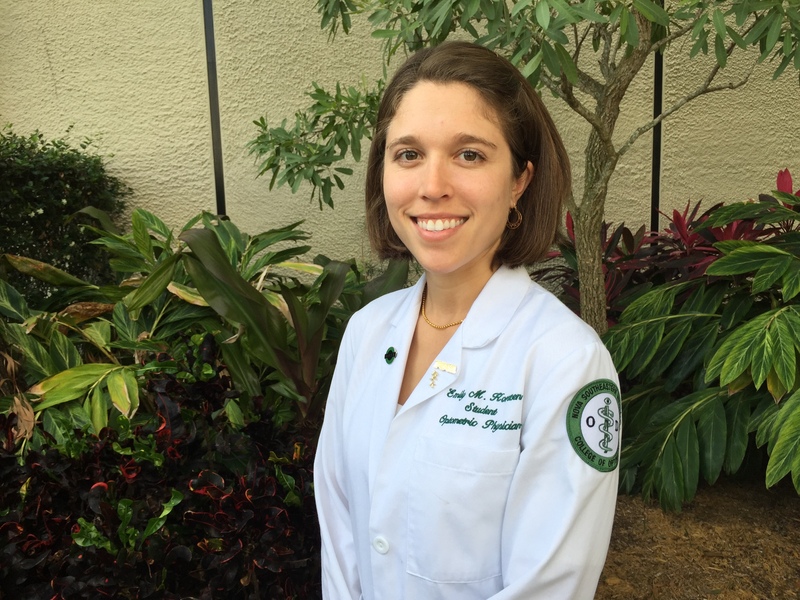 The National Board of Examiners in Optometry (NBEO) has announced that third-year NSU College of Optometry student Emily M. Korszen tied one other student for the highest score in the nation on the Part I Applied Basic Science (ABS) Examination in 2015. As a result, Korszen will be presented with the 2015 Dr. Norman E. Wallis Award for Excellence by Melvin D. Shipp, O.D., Dr.Ph., M.P.H., president of NBEO, at the Annual Meeting of the American Optometric Student Association (AOSA) in Seattle on June 26. The award was established to honor Dr. Wallis’ 25 years of outstanding service as executive director of NBEO. Korszen will receive a personalized plaque and a full refund of the Part I ABS registration fee. Korszen is on track to graduate from NSU’s College of Optometry in 2016. A native of Englewood, Florida, she earned her bachelor of science in neurobiological sciences with a minor in East-Central European Studies from the University of Florida in Gainesville. Korszen previously received the J. Pat Cummings Scholarship from the American Optometric Foundation and was named to the NSU Health Professions Division’s Chancellor’s List for six consecutive semesters for maintaining a GPA in the top 5 percent. Korszen is active in extracurricular activities, serving as secretary of NSU’s College of Optometry’s Student Government Association, vice president of the Gold Key Optometric Honor Society, class representative of the American Optometric Student Association, and as a member of Beta Sigma Kappa Optometric Honor Society, where she tutors fellow students. Established in 1951, the National Board of Examiners in Optometry is a private, nonprofit organization that develops, administers, and scores examinations, and reports the results, that state regulatory boards utilize in licensing optometrists to practice eye care. Licensure is a public interest, public protection regulatory function of many professions, particularly in the health professions, due to the importance of receiving competent care. In serving the public and the profession for 64 years, the National Board has compiled a distinguished record of accomplishments that include being the first national board among the doctoral level health professions to eliminate grading-on-a-curve, and one of the few national boards in any profession with a repertoire of examinations that includes conventional multiple-choice tests (single- and multiple-response items), computer-based examinations, and a clinical skills test with standardized patients at the National Center of Clinical Testing in Optometry.